Sorry, only subscribers can access our content. 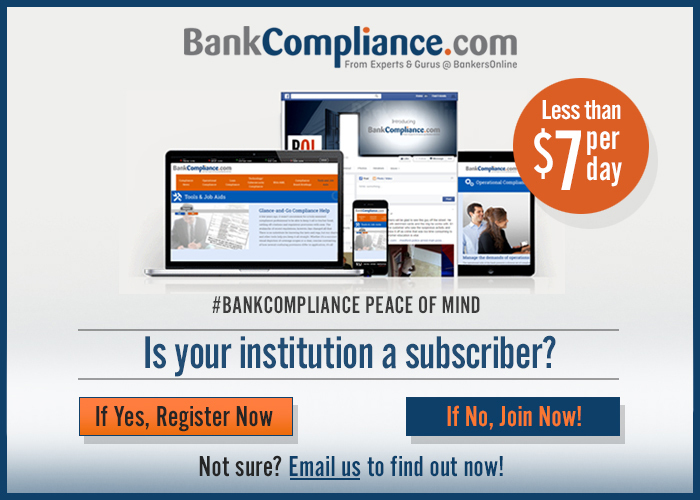 Quick email answers to your compliance questions. SelectAppraisalsAuditBSACollectionsDodd-FrankEscrowsFair Lending / ECOAFlood ComplianceHMDA / CRAInsider LendingIntegrated DisclosuresMilitary LendingOtherPolicies/ProceduresRegulatory GuidancePrivacyReg ZUDAP/UDAAPWhat are Loan Compliance People Asking? SelectAdvertisingATMsAuditBranch OperationsBSABusiness AccountsConsumer AccountsDepositsFraudMerchant AccountsPaymentsPolicies/ProceduresPrivacyRegulatory GuidanceSafe depositUCCUDAP/UDAAPWhat are Operations People Asking?